On Saturday Sept 20th/2003 we had made plans to re-visit the BGT. We met up with Paul, Matt and Mike at the Tim Horton's at Mud and #20 HWY at 9:00 pm. Once we arrived at the tunnel there seemed to be something totally different about the place this night. One could feel a strong presence near the entrance to the tunnel. There was no wind at all and the night time sky was clear with many stars. I started to take pictures at the entrance. In the first couple of shots nothing really showed up. This was the first picture taken at the entrance showing Paul, Mike and Matt going into the tunnel. As seen in the photo nothing out of the norm was present. The picture also shows that the night indeed was clear of any fog or mist in the air. 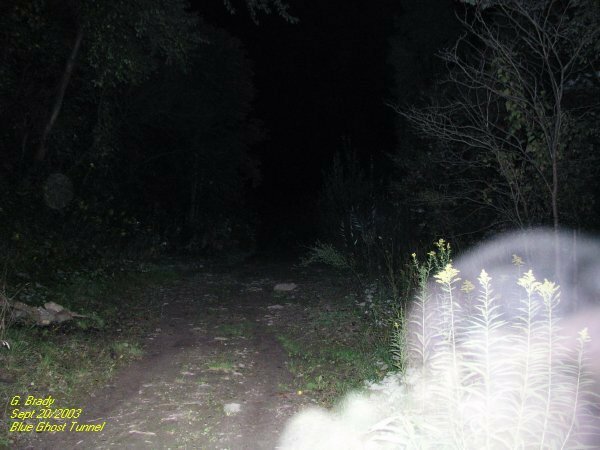 Cathy had taken this photo of the entrance before we started into our investigation. 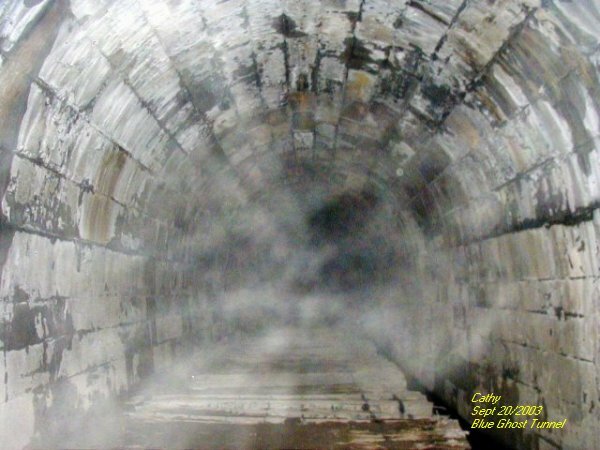 In the top left corner by the entrance you can see some faint ecto mist by the ceiling of the tunnel. Also there was an energy strand of blue at the top of the tunnel..... The hand you see on the right was Paul's hand pointing to the area where he had seen something move. Cathy had gone inside and took this photo looking back out of the tunnel. As seen in the picture to the right you can see an energy form taking shape. Was it coming in or going out of the tunnel? Facing back on the trail that leads to the tunnel I could feel something near by. 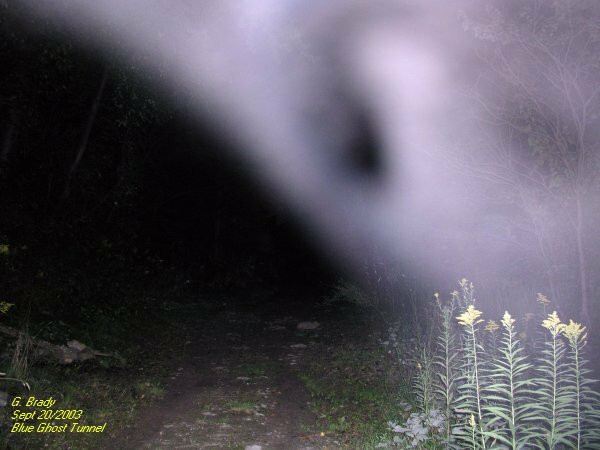 In the above photo you can see a different shape that was forming. In this ecto mist you can see vibrant colors of bluish purple in the form. 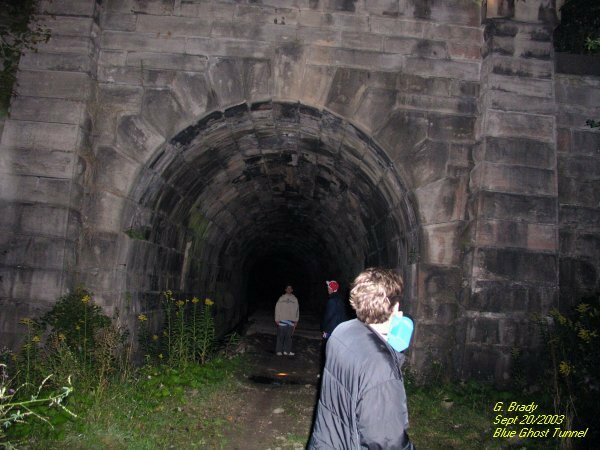 Our guests were also aware of a presence near the tunnel. 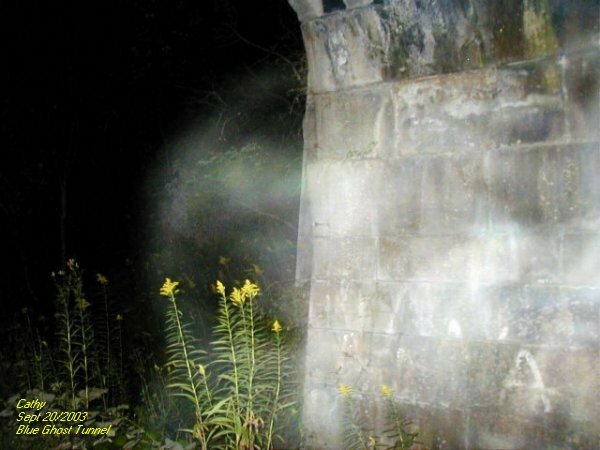 This photo that was taken a few minutes after shows an ecto form with energy to it. On the left hand corner you can make out what appears as an arm with a very definite outline to it. There are also some faint faces in the ecto form. Notice the vibrant colors within the form indicating energy. I had to wait till the flash was done charging before I could take this photo. 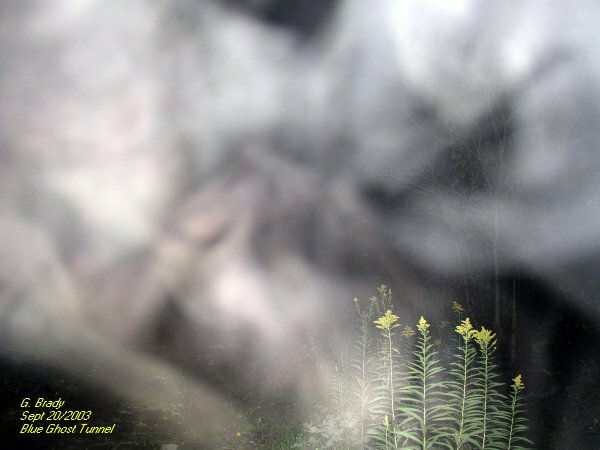 Whatever the form of energy was, it started to move away and it appears as though I got the tail end of the form as it moved. 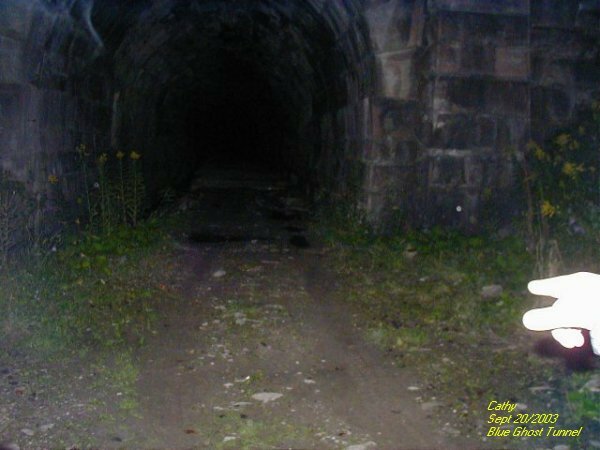 Cathy had taken this picture and captured an ecto form making its presence known to her by almost blocking the entire tunnel entrance.